Musicians these days, eh? High quality, ultra-talented exponents of their art can no longer – on the National Theatre’s Olivier stage anyway – be content with sitting comfortably on chairs in classic orchestral formation with nothing but a wayward sheet of music to disturb their concentration and composure. Here though, in the guise of the Southbank Sinfonia in this wonderful production of Amadeus, they are a major part of the action throughout the show. Director Michael Longhurst demands that they stand and deliver, squat and crouch, stretch and sway, move and freeze, creep and crawl and scramble and wave their instruments around like demented orchestral banshees. If you’re a violinist you may well have to lie on your back and fiddle for Vienna; if you’re a percussionist then your timps are likely to float around the stage like whimsical wheelie-drums whilst you follow with your sticks. crescendo-enhanced punctuation marks at important moments in the narrative and we have the pure diamond-encrusted resonance of Mozart’s music permeating the space and enthralling the audience. In Sound Designer Paul Arditti therefore, Longhurst is fortunate enough to have been able to unleash his own jewel on the proceedings. Arditti gets the acoustics, feels the rhythm and identifies the vibe. 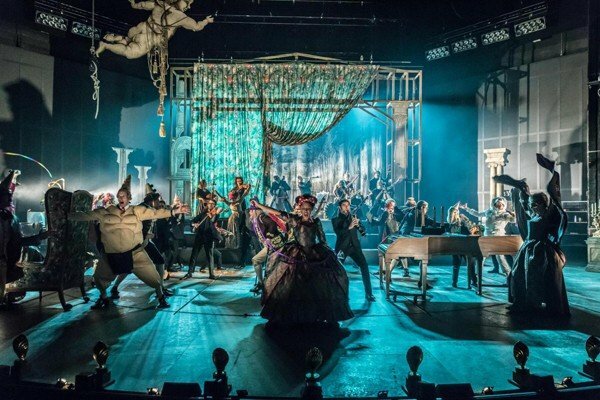 The show depends on natural, balanced sound and Arditti delivers: Amadeus is a beautiful play, Longhurst’s is a consummate production and Arditti’s input elevates it to greatness. With all this in place, Longhurst can allow his actors to explore the text in depth and push writer Peter Shaffer’s ideas to the limits. The play is about jealousy, artistic jealousy, and like all tales of jealousy it doesn’t end well. Salieri knows that there is not one single note of Mozart’s music that he, Salieri, could aspire to compose. It eats at him. It eats at his art, his creativity, his mind and, ultimately, his soul. It destroys him, inwardly, far more effectively than his own pathetic attempts to destroy Mozart. Yes, so he can obstruct Mozart’s preferment in court, he can ensure that his operas don’t get the recognition they deserve and he can manipulate the minimal patronage that Mozart enjoys so that his money dries up. He can do all this but he cannot vitiate genius and thus he dies an embittered and broken man. Shaffer, the master craftsman of epic theatre (The Royal Hunt of the Sun (1964) and Equus (1973) also premiered, like Amadeus (1979), at the National) came to his subject via Puskin’s verse play (1830) and Rimsy-Korsakov’s opera Mozart and Salieri (1897) but it’s his exploration of the soul, of Salieri’s deep-seated loathing of himself and his strident anger with God that marks this play as a work of theatrical genius. It grips us, it moves us, it demands that we question our own motives and it asks us to pay homage to a tortured genius whilst reviling Salieri’s tortured mediocrity. gossip – a delicious counterpoint-duet by Sarah Amankwah and Ekow Quartey. Edgy and down-to-earth Constanze – Mozart’s wife – is astutely played by Adelle Leonce whilst Fleur de Bray dazzles with her trills and mesmerises with her arpeggios as soprano Katherina Cavalieri. There is an array of Court caricatures with Alexandra Mathie, Hugh Sachs, Christopher Godwin and Andrew Macbean leading the way with deadpan throwaways and exaggerated disapprobation. And these are led by slightly dopey, slightly dotty, slightly disingenuous Joseph II – played with succulent sparkle by Matthew Spencer. But, of course, it’s the rivalry, the tension, the sheer unvarnished venom of Salieri’s relationship with Mozart that takes the show to the rarified heights of perfect drama. Adam Gillen, as Mozart, is a Saint Vitus dance of a personality: a snot-nosed, potty-mouthed, offence-prone, devil-may-care aficionado of the inappropriate remark and awkward wisecrack. His tourette’s-littered speech is matched by his knee-jerk physicality and when conducting his music he displays all the frantically frenetic movement one might see in the death throes of an octopus. Gillen is outstanding and he repels us and gets us in equal measure: a pathological genius tinged with pathos – an extraordinary performance. without us ever warming to him, let alone loving him. look up and shoot pitying glances across the room to a silent Salieri, sitting alone, simmering, seething and shunned by all. It’s a kind of poetic justice, the kind of poetic justice that sees the genius of Mozart revered whilst Salieri is the forgotten man. Except, that is, when Amadeus is performed. 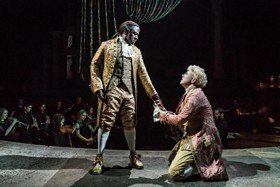 Amadeus features live orchestral accompaniment by Southbank Sinfonia with Adam Gillen and Lucian Msamati reprising their roles of Mozart and Salieri. Cast also includes Sarah Amankwah, Fleur de Bray, Wendy Dawn Thompson, Carleen Ebbs, Nicholas Gerard-Martin, Christopher Godwin, Matthew Hargreaves, Carla Harrison-Hodge, Adelle Leonce, Michael Lyle, Andrew Macbean, Alexandra Mathie, Eamonn Mulhall, Ekow Quartey, Hugh Sachs, Matthew Spencer, Everal A Walsh and Peter Willcock.